The recusant Beats, like a whiff of cayenne, have a way of gaining your attention, and here they direct their monkey-wrenching, fortifying voices (in 13-part disharmony) at the microphone of poet Meltzer’s tape recorder, conveying a whole lot of history and a bracing handful of ideas and opinions. Part of this collection was published 30 years ago as The San Francisco Poets, in which five poets (Kenneth Rexroth, Lawrence Ferlinghetti, William Everson, Michael McClure, and Lew Welch) gave vent to their disarming, discomfiting, disruptive dissent, all the while playful and alive to the vernacular. To this group have been added recent interviews with Diane di Prima, Jack Hirschman, Joanne Kyger, Philip Lamantia, Meltzer, Jack Micheline, Gary Snyder, and Philip Whalen—plus updates with Ferlinghetti and McClure. Meltzer (Poetics/New College of Calif.) emphasizes the poets’ personal experiences and influences, which collectively is more incandescent than any of Joshua’s light shows: Hemingway, Raphael Soyer, Cocteau, Surrealism, the San Francisco Libertarian Circle, anarchist youth groups, etc. Rexroth is decidedly the most confrontational, talking of music and war and homegrown American radicalism as if his hair was on fire, while Micheline is the rawest (“I lived my poems. More than some of these intellectual bastards”). Welch also speaks of the immediate, when as a cab driver he read some of his work to his colleagues: “Goddamn, Lewie,” one said, “I don’t know whether or not that is a poem, but that is the way it is to drive a cab.” And Ferlinghetti, wonderfully, carries on from 1969 (“I have nothing to say. I haven’t got my crystal spectacles on”) to 1999 (“It’s a technophiliac consciousness that seems to be sweeping the world. And more than that, it’s that huge all-engulfing corporate monoculture”). 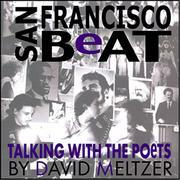 The Beats, Meltzer urges us to remember, thought more about life than about poetry. Just now, as we begin to slip into a national slumber somewhat akin to that of the Eisenhower years, it’s exhilarating to have this squall line of Beats pass through our consciousness.